prosit [latin] = "it shall be useful"
The fundamental principle of PROSIT is simplicity. 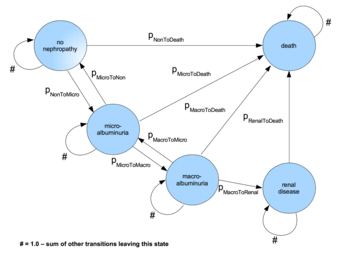 Our objective is to search for the most simple, but transparent and easy to understand approach for developing Markov type disease models. Another prominent feature of PROSIT is its linkage to teaching especially in medical informatics and in health economics. Regularly student groups are working on modelling projects and are collecting first experiences in practical scientific working. The models are published under the open GNU Public License Version 2. Please note: all models published before 2017 are prototypes. If you have questions, feel free to ask them by mail or in our discussion sites Schramm and Pobiruchin. If you want to use content of this page or if you want to contribute, you have to do this in accordance with the GNU Free Documentation License and the GNU Public License version 2.0. Structure of the PROSIT Nephropathy Diabetes Disease Model nick named "Shannon B". This page was last modified on 29 October 2018, at 13:17.